Hi, new forum member and new M3 owner this year. From Sweden and the last birthday was i told that this year i turned 42. Hope to post up some more pics on my car i the right corner of the forum, but untill then, here is a pic. Last edited by Toxicarea; 08-25-2014, 07:06 AM. Welcome to the site! Car looks great. I've tuned 31, again. Last edited by Spennzer; 09-01-2014, 03:17 AM. Hello, my name is Spencer and I'm a an addict. I am 28 years old and do industrial electrical testing, work mostly in va/nc. My nearly year long acquisition process of getting my dream car where it belongs ended 2 weeks ago when I brought home my third bmw. It's a diamantschwarz metallic 88 m3. All original except for the recaro sports were removed and in their place are a pair of corbeau gt seats. Loved the cars from the start. Genius designs and perfect layout made wrenching easy and everything just made sense to me on the cars. Anyway after some talk he asked me if I was interested in buying an m3. I thought he was talking about the e92 and I told him someday ill have one but not in the budget at this point in my life. 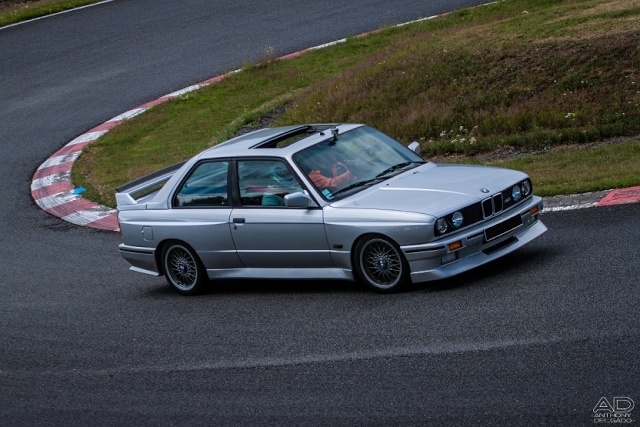 He said no no I have an e30 m3 I am trying to find a good home. Omfg he says he will sell it to me cheap. I'm drooling at this point. I tell him some peoples cheap for one of them is 20k. He laughs. Tells me the story. He bought the car for his son. He wasn't interested in it other than having a car. His son was having a baby and needed to buy a 4dr practical car. He gave his son 3000 for a down payment on a Subaru and in exchange got the rights back for the m. After hearing this I'm totally throwing a rod. Go look at the car that weekend and it's amazing. I was worried about the condition of it after talk of purchase price not being enough to even buy 2 s14 connecting rods. After I told him I wanted the car but it might take a bit to get money together as I just bought a house and was remodeling it to move in. He promised he would hold it for me until I was ready. Too good to be true. I snapped some pics got the vin checked for rust. Battery was dead so I didn't get to hear it run. I didn't care if it didn't have a motor in it it was going with me. Finally got the house to the point where I got my girlfriends blessing to go get the car. It's here and Ive been tinkering it trying to get a few little things in order. Any advice as to what I can say to my loved ones about why I'm so gaga about this machine? They think I'm gonna run away into the sunset with my new midnight lover as the misses calls her. Thank everyone for the help and advice I've taken from here and I hope to be able to contribute as we'll. Welcome to the site! Glad you were able to find the M3. "cheers"
first time ive owned a bmw so its all new to me at the momment ' anyway great forum the pics alone have answerd many questions . i have many more . New here and not an owner yet, hoping that will change soon! I'm based in London, however travel to the US usually every 6 weeks with work in varying locations - next trip in Austin in August. I'm not new to BM's or E30's, but keen to add an M3 to my collection. I would ship a car back to the UK, so will place up a wanted advert in due course. Sorry for the late greeting Em30, and glad you joined Tom! Welcome to the site fellas. I've got a 90's 215bhp since 01/2014, I'm trying hard to make it cleaner and cleaner. Well it is about time. After about 2 years of lurking on here and trying to learn as much as I can. I have finally managed to purchase a E30M3. It is a 87' DS US spec car that went from the US to Japan and then finally to Aus. However the previous owner has tried to do a RHD conversion so all of the interior is gutted. So I need to rebuild it all, and also work out wiring. So expect lots of questions from me in the coming months as I try to get this car put back together and started again.